I could almost hear the huskies chanting Ricky Bobby’s favourite line as they bounded across the pristine snow of the Lyngen Alps outside of Tromsø. They had rocketed off as soon as I’d let go of the brake, accelerating as fast as they could as snow appeared in powdery puffs all around them and their long tongues began to hang out from the exertion. My lead dogs chomping at the bit, waiting to set off into the wilderness. Standing on the runners of my wooden dogsled, I flew along the mountainside. 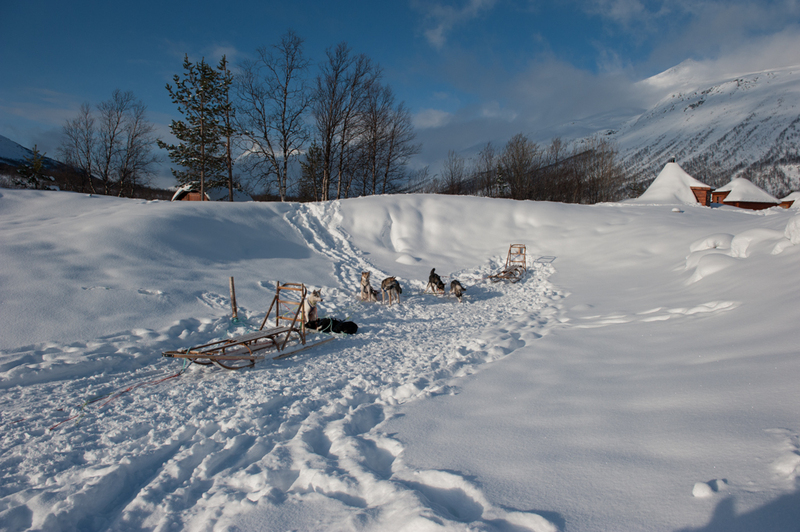 Snow crunched below us, making way for the weight of the sled and the light steps of the four dogs in front. I remembered the exhilaration of being in control of my own team of dogs from my previous trip a year before, but this time it was different. This time, I was sledding through the complete darkness. It turned out that I could see much more than I ever expected. The drivers of each of the four sleds, including the guide, were wearing headlamps. This meant that I could see bright dots in the distance that showed me the general direction in which we’d be heading; it also meant that my dogs were very visible as they flew across the snow in front of me. The fact that visibility was limited to a few lights and the vague shadows of the wilderness surrounding us made the trip that much more special. 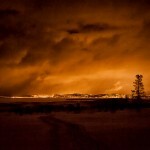 The landscape seemed almost mystical, a mysterious wonderland of life and snow that was just beyond our reach. Imagine this landscape...but in silhouette, lit only by the twinkle of starlight. 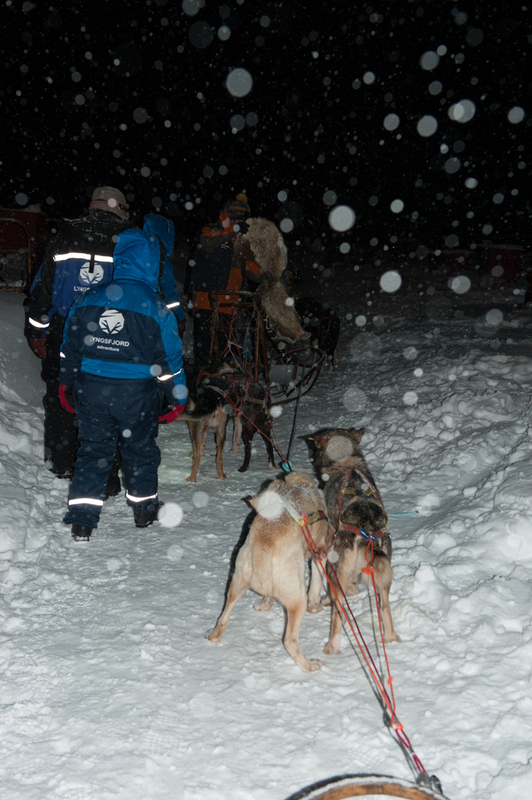 Even if we’d been charging through the dark with no lights to guide us, the dogs would have been just fine. They enjoyed the chase, always trying to catch up to the sled ahead, so they were never in any danger of losing the trail. I spent a lot of time feeling constantly unbalanced as I had one foot on the brake and one on the runner. Balance is crucial on the back of a sled to make sure you help steer it in the right direction and not into a big bank of snow. The lead dog kept turning around and giving me the meanest death glares. Having met him before we set off, I knew he was just as sweet as all the huskies I’ve met in Lapland, but boy did he not like me slowing him down. He wanted to GO FAST, so why wouldn’t I let him? It's much better when these eyes are not glaring at you! Trying to compromise with the dogs and let them see that I wanted them to go fast too — just not when it meant they were trying to overtake another sled — I changed my driving style slightly (something I had the luxury of doing as the last sled in the pack). Stopping the sled completely, I watched as the lights of the other sleds became more and more distant. 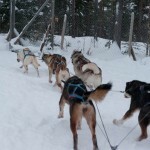 Then, when I let go of the brake, the huskies could go as fast as they wanted until we’d once again caught up. I got a lot less death glares, the sled felt more balanced, and I got to experience the sheer joy of being on a sled that felt like it was going at incredible speeds. Wins all around! Near the halfway point, where the loop we were making through the mountains began to turn back towards home, I caught up only to find all the rest of the sleds had stopped. I didn’t have to wonder why for long because the guide came up to me and turned off my headlamp. We were plunged into darkness as he pointed up towards the sky. As my eyes slowly adjusted, the sky came to life in front of me — a sky that I had thought was obscured by clouds due to the constant snowfall. Where the snow was coming from, I don’t know, because the clouds were gone. The northern lights weren’t out, but the stars were — and that was enough for me. I hadn’t yet seen the unobscured Arctic sky, having been stuck under heavy clouds for days on end, and it was astounding. Just above the dark silhouettes of mountain peaks, thousands of little lights twinkled across the sky. I was excited to be able to pick out the Big Dipper, a constellation I hadn’t seen in so long. How do you cool off during a short break in sledding? Just go for a quick roll in the snow! The dogs didn’t understand why we’d stopped, and while they weren’t howling, they weren’t calmly lounging around either. So, to cheer them up, we clicked our lights back on, let go of the brakes, and flew back down the mountainside and through the forest (where there were constant calls of “TREE!” as people on the sleds in front tried to help each other not get brained by low branches). Perfectly warm in my borrowed Arctic suit, I would have been happy to do another lap, but eventually we found ourselves back in the husky farm. We patted and thanked our dogs, who were doing their best breakdancing impressions as they rolled in the snow to cool off. So engrossed was I in the huskies that I nearly missed our present. 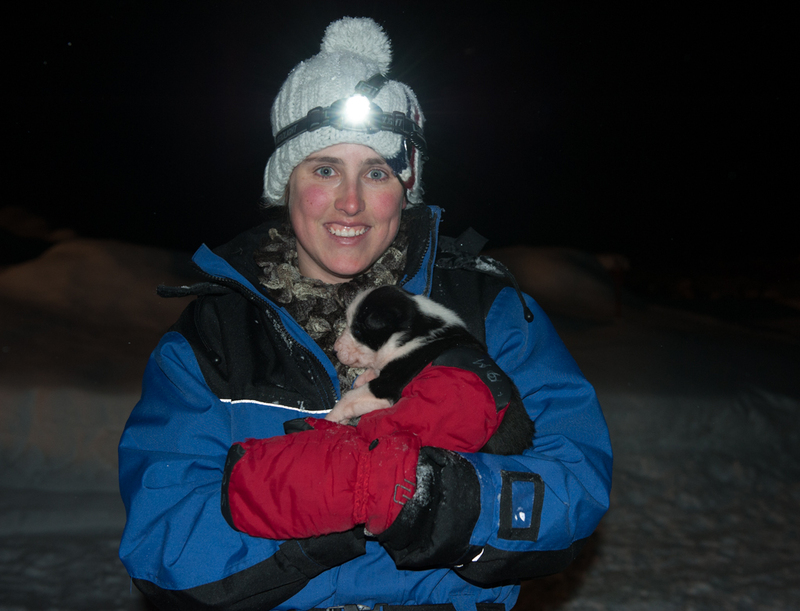 Because none of us had fallen off our sleds, our guide went into the kennel and brought out our reward — a veritable stack of three-week-old puppies. They were the most adorable little things that tried to burrow deep into your arms as soon as you were given one. I had real trouble parting with the one I’d been given — partly because he wanted to stay curled up in my body warmth, and partly because I thought he was so cute — but the thought of taking care of a puppy on the long trip I had ahead didn’t appeal so I eventually gave him back. Cuddling up with a three-week-old puppy once we got back. So which was better — sledding during the day or the night? It’s hard to say, but this nighttime trip was such a magical experience that I would do it again in a heartbeat…especially if there were more adorable puppies waiting for us at the end! Which would you prefer? Sledding under the blue skies and golden sun or under the stars and possibly the northern lights? 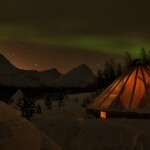 I visited Camp Tamok and went dogsledding courtesy of Lyngsfjord Adventure, but all opinions stated here are my own. They offer day trips and overnight trips to Camp Tamok daily during the winter; prices start at 1695kr including round-trip bus transfer (75 minutes each way). What’s It Like Sleeping in a Tent When It’s -20C? No comments on this post? Can’t believe it. What an amazing experience you had and so great to read that such a trip is possible. I’d love to do that one day. What a beautiful animals. I’ve added your post to my new series of inspirational lifestyle & travel stories. Good luck with your adventures. Hi Nienke, sorry for the delay, but thanks so much for your comment and for featuring my post in your new series. You’ve compiled such a great list of posts there that it’s going to take me a little while to get through them all! I agree that the huskies are incredibly beautiful animals. They’re so well trained yet the biggest sweeties when they’re not running. 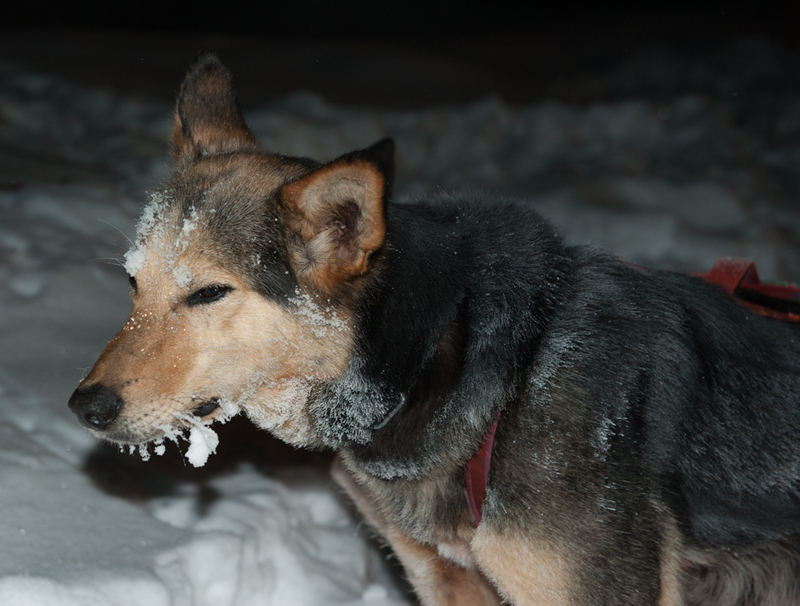 Any dogsledding trip is worth it just for the dogs, but this one was extra special. Hi Kristin! Great post, great adventure! I stumbled upon your website while planning my trip to Finland for this winter. I think, I would prefer a day safari but can’t decide about one thing, where you could possibly help me: Would you recommend solo driving or rather enjoying the ride as a passenger – if you especially had the budget only for one safari? Thanks and happy trails! Hi Maho! That’s great that you’re planning a trip to Finland this winter — you’ll absolutely love it. 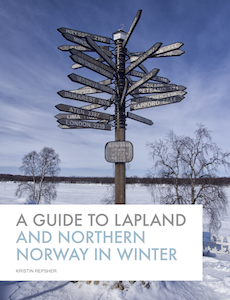 If you want, I can let you know when I publish my ‘Guide to Lapland in Winter’ in November in case any of that will help you out? Anyway, I think if you’ve only got the chance to do one dogsledding trip, you should do it during the day. It was an awesome experience going at night, but I’m glad I’d previously been in the day because otherwise I would have really felt like I was missing out on all the sights. 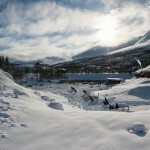 If you’d like to read about my dogsledding day trip, it’s available at http://www.bootsandabackpack.com/dogsledding-in-a-winter-wonderland/. I also went dogsledding during the daytime again on my trip in 2013 so I’ll be publishing a post about that in the next few months. As for whether you should drive or enjoy the ride as a passenger, it’s a tough choice! Some places let you swap out so you spend half the ride as the driver and half as the passenger so you get the best of both worlds. It’s truly exhilarating to be on the back of a dogsled when it takes off, and once the nerves wear off it’s good fun being the driver! 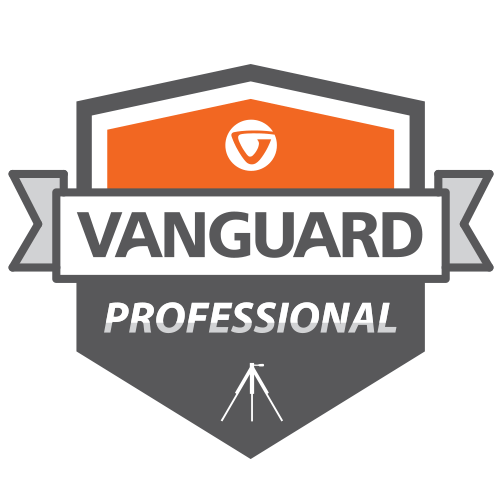 However, I recommend taking a GoPro that you can record video/photo with because you always have to hold on with two hands so you can’t take any photos (unless you’re stopped and anchored). That’s the benefit of being the passenger — you can take photos (and you can bury yourself in reindeer skins to keep warm too)! If I had to choose one, though, I’d go for driving the sled. Thank you Kristin for the detailed information! It was truly a great help making up my mind. Much appreciated! I’d love to check out your Lapland guide. Will you publish it via newsletter? In that case, I am already subscribed with my private email address, and will make sure to read it. Thanks again, and please keep on taking those great shots! Hi Maho! So glad I could help — and please let me know if you have any other questions about anything to do with your Lapland trip. I’m always happy to talk about Lapland! As for the guide, I will be publishing it as both a guide on this website and as an ebook so it is accessible offline. I’ll definitely let everyone know via newsletter when it comes out though. Thanks very much for subscribing!